Drawn to Barrier Free Living’s mission to support people with disabilities, Rachel Oliner shares with us her initial goals as the new Coordinator of Family Services at Freedom House domestic violence shelter. BFL: What drew you to apply at Barrier Free Living’s Freedom House? Rachel: I have always wanted to work with survivors of violence, particularly with women and children. I also felt that the staff was close-knit and respectful of each other, and I loved BFL’s mission to help support people with disabilities. BFL: What do you most look forward to tackling in your first month? Rachel: I’m excited to meet my clients and begin to work with them to help them achieve their goals. BFL: Is there an area in your work you feel especially passionate about ? Rachel: I’m passionate about one-on-one counseling, and I see myself more as a partner to my clients than their counselor. I’m excited to develop and nurture relationships with the staff and the residents at Freedom House. Rachel: In my spare time, you can find me cooking, going to see live music, or working out. 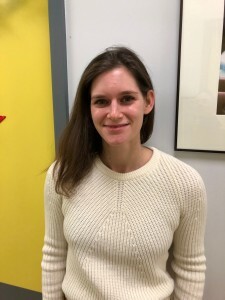 Trained as a clinical social worker, Rachel received her MSW from New York University and has worked on crisis hotlines, counseled in private practice, and led family therapy in people’s homes. She grew up in Maryland, spent a few years in Philadelphia, and has lived in NYC for the past five years. Before social work, she lived a past life working as a digital strategist for several ad agencies.